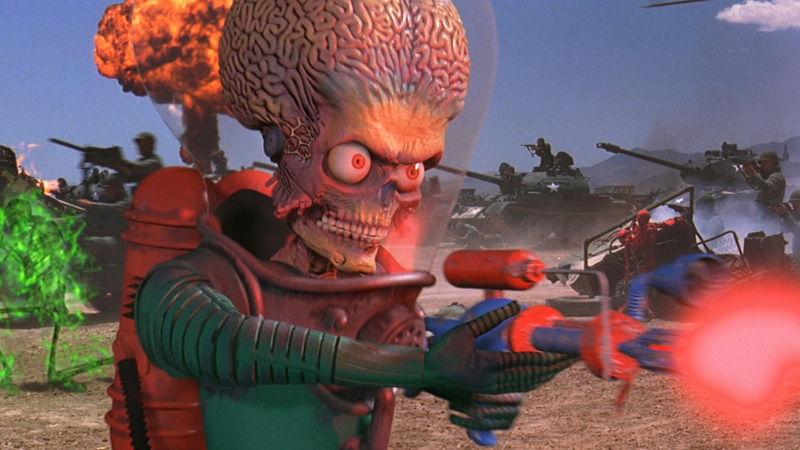 MARS ATTACKS has a number of amusing bits, but director Tim Burton’s 1996 send-up of 50s sci-fi flicks and a venerated series of violent, controversial trading cards that delighted kids and outraged parents in 1962 is just too overdone and self-amused to warrant a place on my shelf. Eighty million bucks on production, another twenty to promote—the movie took in about a hundred-spot worldwide, so it’s considered a disappointment. Uh, it’s about invading Martians with big heads, mercilessly roasting every human in their path. Humanity responds just about as pitifully as we probably would (will?). Reviews were mixed, with about half finding enough delight in the mayhem, set-pieces and production design, and half thinking the jokes mostly fell flat and that a campy attitude mixed with a mega-budget wasn’t enough. The movies 106 minutes seem like many more, and after the first few action episodes I felt more like re-watching one of the movies it was parodying than finishing this one. The title sequence–with waves of flying saucers zeroing in on the familiar blue of hapless Earth, backed up by Danny Elfman’s pitch-perfect retro music—is the best thing about the whole bloated fizzle. Overloaded cast give progressively weak jokes the old matinee try: Jack Nicholson, Glenn Close, Sarah Jessica Parker, Pierce Brosnan, Martin Short, Michael J.Fox, Annette Bening, Danny DeVito, Natalie Portman, Lukas Haas, Rod Steiger (coming off best in the mob, as a gung-ho general), Jack Black, Tom Jones, Jim Brown, Joe Don Baker, Sylvia Sydney, Pam Grier, Lisa Marie, Paul Winfield, Christina Applegate. While your humble reviewer is not so gaga on this movie, I concede it’s got a heckuva fan base, considering the number of hits the film registers on this site. Are the Martians among us? You’re either with us or…. Nasty aliens attacked the same year via Independence Day and The Arrival. Roger Ebert hit it on the snout with his observation: “Ed Wood himself could have told us what’s wrong with this movie: the makers felt superior to the material. To be funny, even schlock has to believe in itself.” Ack! Ack! Ack! Best part of the movie–the first five minutes.